William Branham claimed that he saw a series of eight prophetic visions in June 1933. In the third vision, William Branham witnessed Germany building a concrete line, and the deaths of many American soldiers on this line. In the Laodicean Church Age book, William Branham says, “Now let me say this. Can anyone prove any of those visions wrong? Were they not all fulfilled?” Over 80 years after 1933, we now have the benefit of hindsight in our ability to confirm the accuracy of these prophecies. William Branham mentions a number of times that he saw a line of defenses (either the Maginot or the Siegried line) being built 11 years prior to the concrete being poured. The Maginot line was built by the French starting in 1930. The Siegfried line was, in fact, part of the Hindenberg line that was built by Germany from 1916-1917. The Siegfried Line was built between 1938 and 1940. On 24 August 1944, Hitler gave a directive to initiate repairs on the Siegfried Line. 20,000 forced labourers, most of whom were 14-16-year-old boys, attempted to reequip the line for defence purposes. This consisted primarily of building ant-tank ditches. How could "Thus Saith The Lord" be years off in its accuracy? William Branham mentions that the visions that he received in 1933 were “Thus Saith the Lord”. The prophecy was written down, so each retelling of it should have been consistent. However, in 1963 William Branham substitutes the Siegfried line for the Maginot line, and then in 1964 mentions Hitler's mysterious end for the first time in connection with this vision. The version of the vision in the Church Ages Book (published in 1965) is historically accurate, but is not consistent with the audio recorded versions of the vision. Shouldn't something that was "Thus Saith The Lord" be the same the first time, and the last time? Isn't Jesus Christ the same yesterday, today and forever? 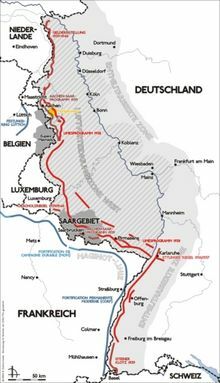 The Siegfried Line, called the Westwall by the Germans, was a defense system stretching more than 630km (392 miles) with more than 18,000 bunkers, tunnels and tank traps. It went from Kleve on the border with the Netherlands, along the western border of the old German Empire as far as the town of Weil am Rhein on the border to Switzerland. More with propaganda in mind than for strategic reasons, Adolf Hitler planned the line from 1936 and had it built between 1938 and 1940. Battles along the Siegfried line include the Battle of Hurtgen Forest (Sept. 19, 1944 - Feb. 10, 1945; 33,000 estimated American casualties, 9,000 estimated German casualties), the Battle of Aachen (Oct. 1944, 5,000 estimated American casualties, 5,000 estimated German casualties), and Operation Market Garden (3,500 American casualties, 6,484 British Casualties, and 4,000 - 8,000 German casualties). Other major offensives across the Siegfried Line that did not include the American forces, including the Battle of the Schelt and the Battle of Moerbrugge (both led by Canadian forces), were Allied successes with few casualties and large numbers of German soldiers captured as POWs. One reason so many American soldiers perished in the Battle of Hurtgen Forest was the German method of bombing, and the American soldier's method of defense. Ernest Hemingway, who was there, described the battle as Passchendaele with tree bursts. Tree bursts is a technique of using artillery shells that burst in the treetops causing hot metal shrapnel and wood fragments to rain down. Since American soldiers had been trained to fall prone when artillery fired, this technique proved particularly deadly until American G.I.s learned instead to "hug-a-tree" during bombardment. Passchendaele was a reference to a terrible battle in the first World War. Adolf and Eva Hitler committed suicide together on April 30, 1945 at the Führerbunker in Berlin. Eva was Adolf's long-term mistress whom he had finally married on April 29, 1945. After much debate, most historians have concluded that Hitler shot himself in the right temple while simultaneously biting into a cyanide capsule, while Eva died from cyanide. Their corpses were doused with gasoline by other Führerbunker aides in the Reich Chancellery garden just outside the bunker's emergency exit, and set alight as the Red Army advanced. These charred remains were found by the Russians and, to avoid any possibility of creating a potential shrine or rallying point for the Nazis, were secretly buried at the SMERSH compound in Magdeburg, East Germany. In April 1970, when the facility was about to be turned over to the East German government, the remains were reportedly exhumed and thoroughly cremated. 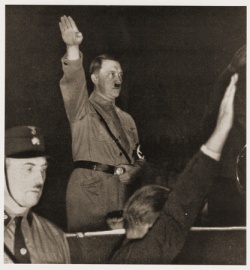 According to the Russian Federal Security Service, a fragment of human skull stored in its archives and displayed to the public in a 2000 exhibition came from the remains of Hitler's body uncovered by the Red Army in Berlin, and is all that remains of Hitler; however, the authenticity of the skull has been challenged by many historians and researchers. German authorities officially released the location of Hitler's bunker in June 2006. The bunker was destroyed by Soviet troops after the war and filled with concrete, however, it was feared that identifying the location of the bunker might provide neo-nazis and other right-wing extremists with a memorial or rallying point. The bunker lies within a quarter of a kilometer of Berlin's Holocaust Memorial, and currently serves as a parking lot. While much is now known or agreed about Hitler's death, most of the details remained a mystery for political purposes (i.e. to deprive Nazis of a rallying point) by the U.S.S.R and East Germany for years following WWII.